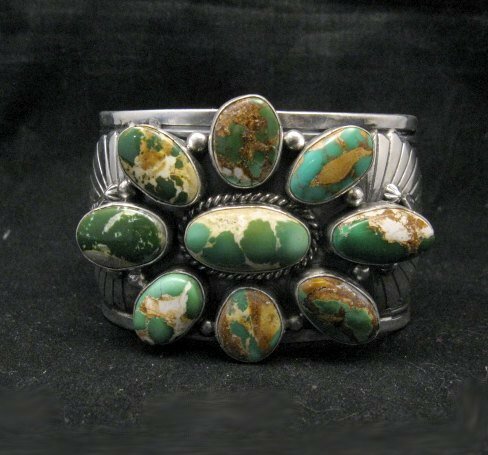 One of a kind Navajo handmade gorgeous turquoise cluster bracelet. 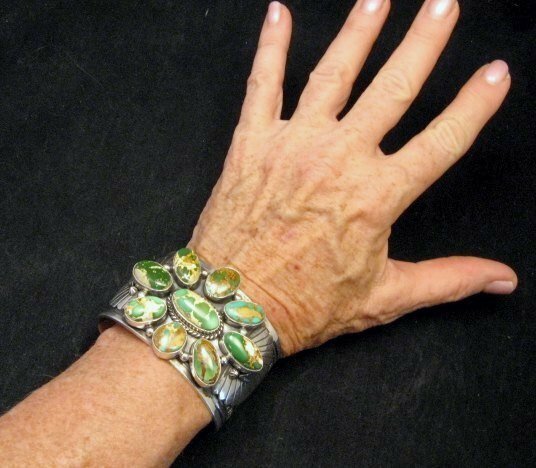 The natural Royston turquoise stones are the focal points of this beautiful bracelet. 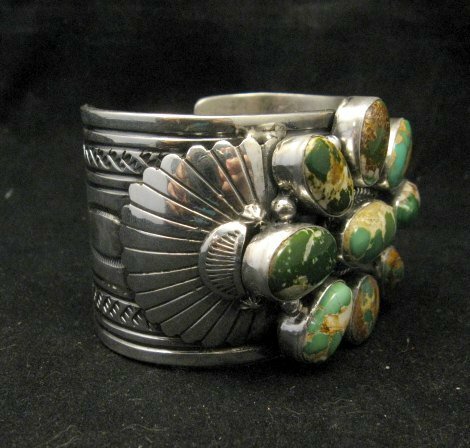 The 1-5/8 inch wide cuff is stamped on the ends and applied silver fans, raindrop beads and twisted silver wire complete the design. 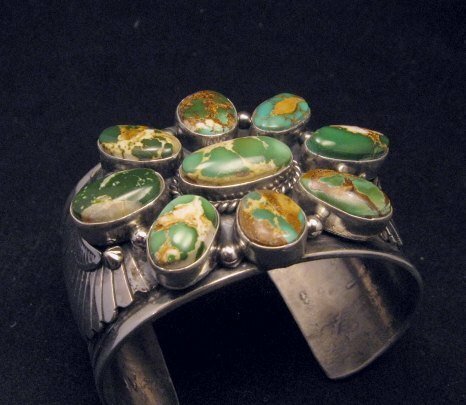 Turquoise cluster is the style of the Southwest. 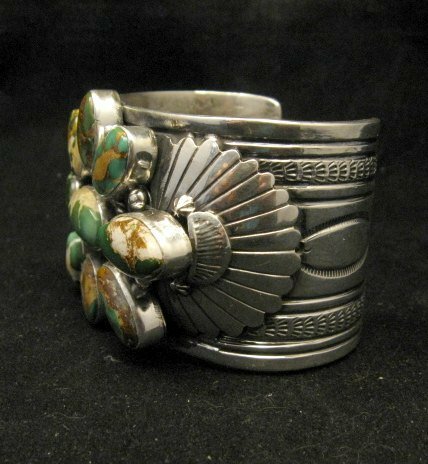 You will find both Navajo & Zuni artists making this type of jewelry. 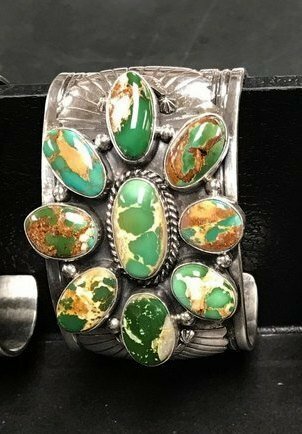 Navajo artist Gilbert Tom made this beautiful turquoise cluster bracelet from sterling silver using high grade natural Royston turquoise stones. The stones are a lovely shade of green with sandy brown matrix. 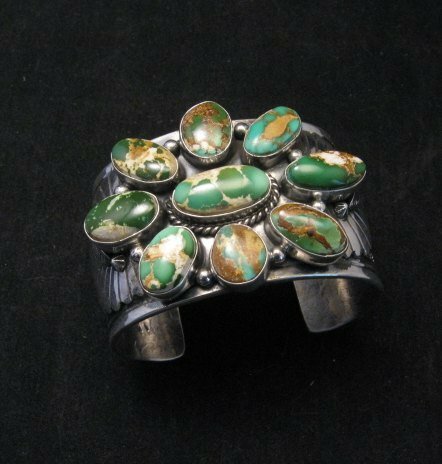 Gilbert learned silversmithing from the late legendary master silversmith Harry Morgan. Measures 1-5/8 inch wide with an inside end-to-end measurement of 5-1/4 inches and a 1-1/4 inch gap. Weighs 133.7 grams (4.72 ounces). Brand new in perfect condition. All stones intact. No cracks or chips. 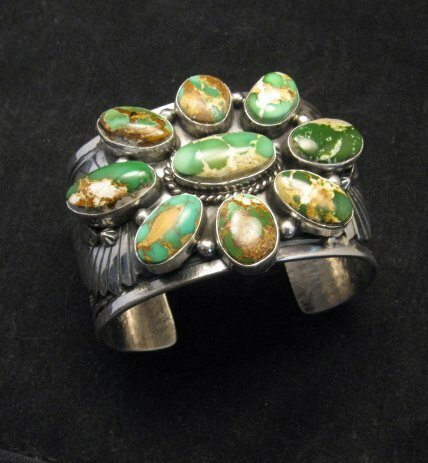 Handmade by Navajo silversmith, Gilbert Tom. Gift box and Authenticity Card included.